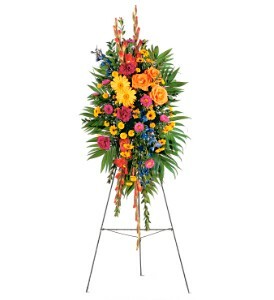 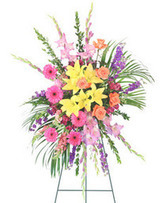 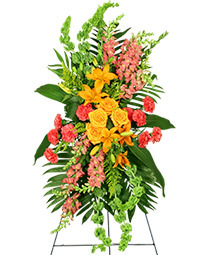 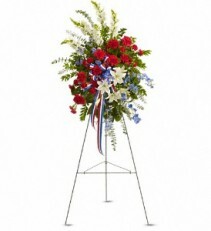 Celebration Of Life Standing Spray, Tf, Each Roses, Cm, Orange, Myrtle, Each Easel, Wire, Local Wholesaler, Green,, Palm, Emerald, Each Gerberas, Yellow, Gladioli, Orange, Each Floracage Holder, Smithersoasis, , Grande, Chrysanthemums, Spray, Novelty, Yellow, Delphinium, Blue, Asters, Matsumoto, Hot Pink, Chrysanthemums, Spray, Button, Yellow, Each Carnations, Purple. 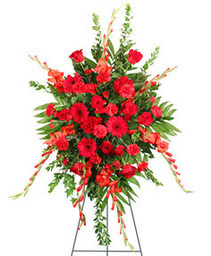 Blessed Heart, Ta, Each Roses, Cm, Red, Roses, Spray, Red, Each Carnations, Red, Carnations, Miniature, Red, Ming Fern, Ivy, Variegated, Each Open Heart, Mache, Smithersoasis, No, Each Wire Easel, Local Wholesaler. 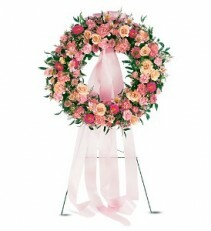 Respectful Pink Wreath, Tf, Waxflower, Pink, Ruscus, Italian, Each Wreath Form, Mchbacked, Smithersoasis, ,, Each Easel, Wire, Local Wholesaler, Green,, Roses, Spray, Peach, Ribbon, Satin, Mcginley Mills, Pink, Carnations, Miniature, Pink, Each Carnations, Pink, Alstroemeria, Pink, Asters, Matsumoto, Rose, Asters, Matsumoto, Pink. 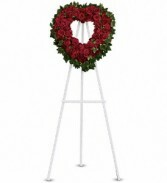 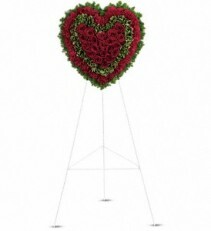 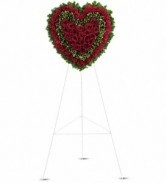 Majestic Heart, Ta, Each Roses, Cm, Red, Each Carnations, Red, Pittosporum, Variegated, Ming Fern, Each Solid Heart, Mache Smithersoasis No, Each Wire Easel, Local Wholesaler. 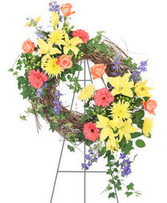 Serenity Wreath, Ta, Each Roses, Cm, White, Lilies, Asiatic, White, Each Carnations, White, Chrysanthemums, Cushion Spray, White, Salal, Oregonia, Dusty Miller, Each Wreath, Mache, Smithersoasis, No, Each Wire Easel, Local Wholesaler. 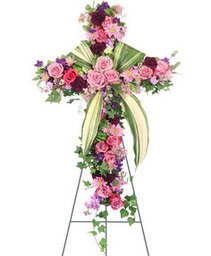 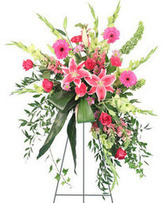 Touching Tribute Spray, Ta, Each Roses, Cm, Pink, Lilies, Oriental, Light Pink, Gladioli, Pink, Each Carnations, Lavender, Each Stock, Purple, Italian Ruscus, Huckleberry, Leatherleaf Fern, Each Floracage Grande Holder, Green, Smithersoasis, No, Each Wire Easel, Local Wholesaler. 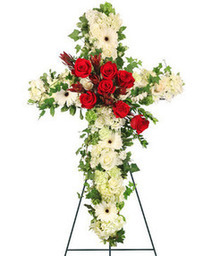 Hope And Honor Cross, Tf, Each Easel, Wire, Local Wholesaler, Green,, Ruscus, Italian, Each Cross Form, Mchbacked, Smithersoasis, ,, Fern, Leatherleaf, Pittosporum, Variegated, Carnations, Miniature, Red, Chrysanthemums, Spray, Cushion, White, Each Carnations, Red. 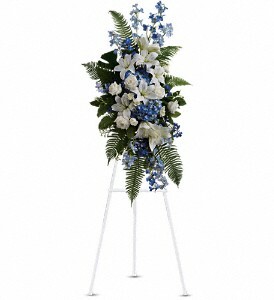 Ocean Breeze Spray, Ta, Each Roses, Cm, White, Roses, Spray, White, Lilies, Asiatic, White, Delphinium, Light Blue, Delphinium, Blue, Each Monstera Leaf, Salal, Sword Fern, Each Floracage Grande Holder, Green, Smithersoasis, No, Each Wire Easel, Local Wholesaler, Hydrangea, Blue. 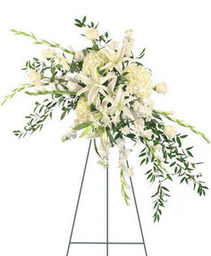 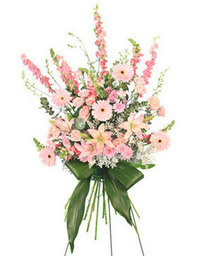 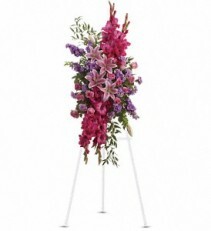 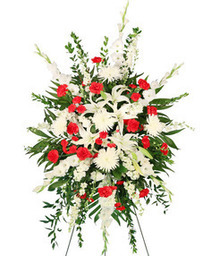 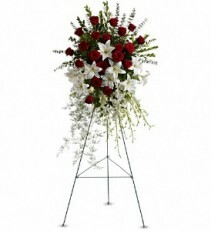 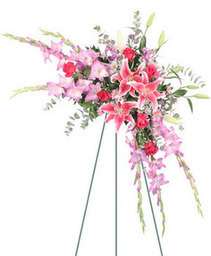 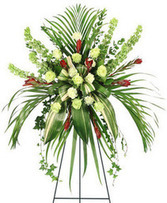 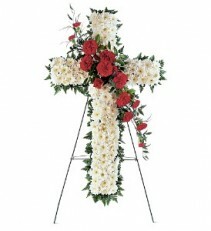 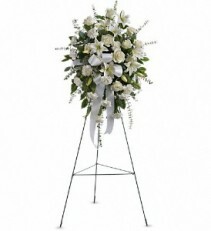 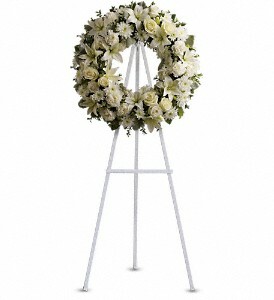 Lily And Rose Tribute Spray, Ta, Orchids, Dendrobium, White, Each Roses, Cm, Red, Lilies, Asiatic, White, Myrtle, Sprengeri Ferns, Leatherleaf Fern, Spiral Eucalyptus, Each Floracage Grande Holder, Green, Smithersoasis, No, Each Wire Easel, Local Wholesaler. 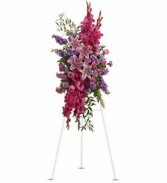 Sacred Duty Spray, Ta, Lilies, Asiatic, White, Each Carnations, Red, Carnations, Miniature, Red, Delphinium, Light Blue, Each Snapdragons, White, Statice, Sinuata, Lavender, Salal, Spiral Eucalyptus, Huckleberry, Poly Satin Ribbon, Tricolor, Offray, Each Floracage Grande Holder, Green, Smithersoasis, No, Each Wire Easel, Local Wholesaler. 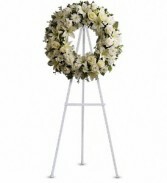 Sentiments Of Serenity Spray, Ta, Each Roses, Cm, White, Lilies, Asiatic, White, Each Carnations, White, Spiral Eucalyptus, Seeded Eucalyptus, Lemon Leaf, Acetate Satin Ribbon, White, Offray, Each Floracage Grande Holder, Green, Smithersoasis, No, Each Wire Easel, Local Wholesaler. 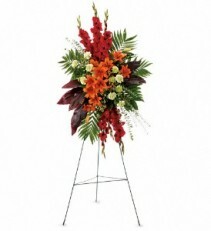 A New Sunrise Spray, Ta, Lilies, Asiatic, Orange, Gladioli, Red, Each Carnations, Green, Hypericum, Peach, Emerald Palm, Each Ti Leaves, Red, Spiral Eucalyptus, Pitta Negra, Salal, Each Floracage Grande Holder, Green, Smithersoasis, No, Each Wire Easel, Local Wholesaler. 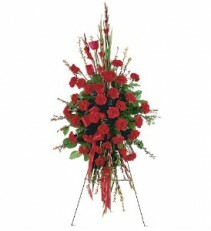 Red Regards Spray, Tf, Ribbon, Satin, Mcginley Mills, Red, Each Brick Cage, Syndicate Sales, Foam Mate, , Brick, Each Easel, Wire, Local Wholesaler, Green,, Huckleberry, Salal, Each Carnations, Red, Each Roses, Cm, Red, Gladioli, Red.